Ishizue wears somewhat revealing clothing for a Hokage, preferring to have mobility over political correctness. Her hair is a cherry blossom color, and her eyes shine a ghostly blue. The attire is mostly black, with segments of red tassels and cloth pieces that sway as she walks. 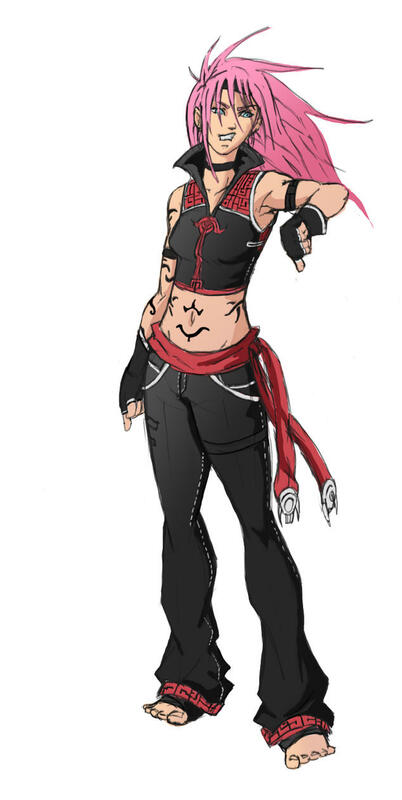 Her hair hangs down extremely low and black tattoo's cover much of her body. Ishizue can be described as the adventurous type, always looking for new and exciting prospects in her life, this isn't limited to say combat, but even the discovery a new and exciting cracker flavor would set off what the people of Konoha have come to know as 'Ishi Mode'. This mode happens when Ishizue is excited and basically increases her heart rate, and slowing her brain activity. During these times Ishizue tends to act psychotically happy, taking great joy out of very meager events and activities. Ishizue also has a very serious side, although she likes to hide it, it has come out in dire situations and times when it would just be improper to make a mockery of the situation with laughter and foolhardiness. Ishizue likes Ramen and Training, but despises Fish. This technique once performed with the appropriate hand seal can allow the user to equally divide their own Chakra among a maximum of 4 clones. The clones are all capable of movement and action of their own will inherit all of the natural Jutsu usable by the caster. If the clone uses a Jutsu of the caster that consumes a great amount of Chakra the clone will be destroyed instantly. The Clones will also be destroyed if the user is unable to control the divided Chakra that each clone has. If the clone is struck by heavy force in any means the clone will be destroyed, also if the clone count is past 4 all clones will be destroyed. A technique that multiplies a thrown Shuriken into many exact replicas of the original. Not just being an illusion but the copies all are able to do real damage and will dispel only physical contact with something. A skilled user of this technique is able to multiply the amount of Shuriken thrown x100. Requirement: Excessive training in each gate before mastery, Admin permission, Must be rank B or higher. The Eight Gates are eight specific points on a person's Chakra Pathway System. They limit the overall flow of Chakra within a person's body. The basis for the idea of the Chakra gates comes from the body's limits on the functions within it. This makes the body much weaker, but it keeps the body from expiring too soon. By opening these gates, the user can surpass their own physical limits at the cost of extreme damage to their own bodies. The state of having all Eight Gates open is known as Eight Gates Released Formation Any Shinobi who activates this state will temporarily gain powers greater than a Kage, but they will die because of the damage done to their body. Hachimon - Eight Gates rules of being used. 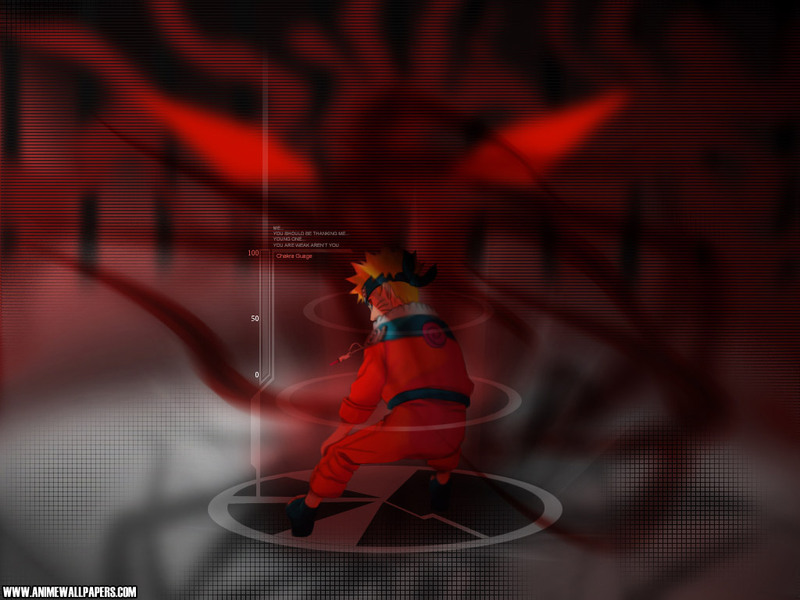 The eight gates is a technique that can be used by the right trained Shinobi, and will cost the user a great deal after each use. However early gates can be opened and cause little to no damage to the user if reach on a masters level. Each gate provides the following and each comes with a consequence after use. In order to open a respective gate the gate before must be opened. Skilled users of the technique are allowed to start the gate opening from gate 5 with the concepts of all the gates before to be in effect. Gate of Healing (休門, Kyūmon):Also located in the brain, this gate increases the strength of the user 50x it's normal limit in addition to bringing the body's recovery patterns up by 99%. Use of this gate will instantly heal all damaged wounds and re energize the user in combat. No physically noticeable change is applied to the body but a continuous Chakra pressure is spawned from their body and visible to the naked eye. The area around where they stand may sometimes be effected by the Chakra pressure. After use the user will experience fatigue and may have difficulty being able to move straight for a while. Gate of Life (生門, Seimon): This gate located on the spinal cord, increases the blood flow of the body causing the skin to turn red. Because of this the user is able to increase their strength and speed 70x it's normal level. The physical performance and flexibility is also effected making the body able to move in ways inhuman. Because of this the Reverse Lotus technique becomes available to the user. After use the user succumbs to fatigue and cannot move nor use Ninjutsu due to low Chakra. Gate of Pain (傷門, Shōmon):Also located on the spinal cord this gate grants the user immense strength doubling the 70x increase of the last gate but due to this it is generally hard even for exceptional Shinobi to maintain the hold in this mode for long. The effect of the users Taijutsu attacks are then amplified to it's maximum causing severe damage on any target of the user. The prediction skills of the user are also amplified due to the rise in psyche that occurs. The user's evasion skills now nearing lightning speed become unable to track with the naked eye. When this gate is used the users muscle tissues will rip causing no movement in the arms or legs once used. (Skilled users will merely feel soreness in arms and legs after use, also there will be a slow recovery rate). The user still succumbs to fatigue and cannot perform Nin or Genjutsu after. Gate of Limit (杜門, Tomon):Located in the abdomen, this gate cannot be achieved by normal ninja only those who possess little to no skill in Ninjutsu (User must not be able to perform S ranked Ninjutsu other than eight gates). This technique allows the user to surpass the limit on movement thus allowing them to jump and remain in the air for extended periods of time also to move breaking the ground where they dash from. They also are able to move faster than visual Jutsu are capable of reading. After using this Jutsu and untrained user risks crippling their body permanently. Gate of View (景門, Keimon):Located in the stomach, this gate increases the amount of natural Chakra send throughout the body. The body' strength and speed are increased by 100x it's normal level. They are also able to perform techniques such as the Morning Peacock, they are able to launch 50 punches and kicks per second separately or in unison and also enable them to travel long distances in seconds. The result for this increase in power can result in the person's muscles deteriorating due to the rush of Chakra ripping through the muscle tissues. Since at this point the chakra network is unable to control the flow of Chakra the user risks killing themselves by using this ability if not properly trained. Gate of Wonder (驚門, Kyōmon):Located below the stomach, this gate allows the user to increase the flow of Chakra, and body performance by 1000x the natural level. due to this the user is able to travel at light speed to distances of up to 500,000 kilometers in a manner of seconds. They can also instantly move faster than any hand seal enabling the user to cancel a Jutsu before it even starts. Each blow of the fist is so strong that an aura of Chakra surrounds every body part used in the attacks insuring instant death upon striking and it can literally destroy a persons mortal foundation through physical combat. Evasion skills become great enough to surpass any Ninjutsu speed and techniques that restrain the target becomes useless against the user of this technique. There is no defense safe from the assault of a trained Shinobi in this gate.This gate can be used a maximum of 4 posts. The consequence for using this is the irreparable damage done to the arms and legs thus forever stopping the use of these body parts ( a master is able to gain slight movement back over time but never to the natural body performance).The user of this technique will also be placed in a coma immediately after use of the technique. Gate of Death (死門, Shimon): Located in the heart. This is the final of the eight gates and thus grants the one who opens this power beyond any Kage. The energies and reserves of Chakra granted to the one using this techniques defies the nature of the natural world. This gate grants the user God-like strength and speed as well as an absolute defense against any technique, Nin, Tai or Genjutsu. The user become capable of moving to any location of the ninja world in seconds performing tasks or assassinations that would normally take years. Every strike on from this form is an assured death if connected yet all are almost impossible to avoid. No kin Jutsu defense is capable of protecting one against a user in this form. The limit on this technique is 3 posts and once the third post has been completed. The user will instantly die being reduced to dust due to the high Chakra level. The heart will pump at a maximum as it will be restoring injuries and damaged tissues just as quickly as they become injured. Because of the stress on the heart it will literally explode inside the chest of the user and the Chakra granted in the gate will eradicate the physical form of the user completely leaving no trace of them. Ishizou was born to well known Shinobi within Konohagakure no Sato. One of these ninja was a respected Ijutsu user (her mother) and the other was one (if not the) top Taijutsu user in the entire Village. Her Maiden name was Rock but it was changed after a brief young marriage to a man she thought she loved. The marriage lasted less than a week (I'm surprised he lasted that long) . Growing up in the ninja academy Ishizou got very basic marks, and used very uninspired jutsu. It wasn't until her father took it upon himself to raise her as a Taijutsu user that she truly prevailed and shined in the ninja world. Ishizou worked with a team after the academy (Where she met the husband), but things weren't ment to be and she ranked to Chunin while the others did not. Ishizou's chunin status lasted about a month before she began preforming A-Ranked missions alone and was recognized for have amazing talent. Promoted to jonin Ishizue continued to train and learn her fathers prized technique, once accomplished she let nothing stand in her way. And as the pervy kage died, he recognized her as his successor. Ishizue has been leading the village for a few years now, but has yet to earn the respect of the villagers. She looks forward to inspiring the next generation, and finding someone worthy of Hokage to pass the title off too.